Charlie is an electrician. A brave electrician, apparently. I’m not sure what qualifies him as brave. Maybe he works on circuits without flipping the breaker? Although that would make him a stupid electrician, surely? Ahem. I seem to have digressed from the point somewhat. Anyway, one day, Charlie the brave electrician was working all alone, when, suddenly, the ground gave way beneath him and he fell into a deep hole. As he was falling, a curious light came to his rescue and stopped his descent, allowing him to land safely at the bottom, in a treacherous cavern. Sadly, his helmet light broke in the fall, and so it is only with the aid of the mysterious light that Charlie is able to move and explore the world he finds himself in. Coming from AntiCrunch Studios, Walk the Light first saw a release way back in January 2016 on Steam. Originally scheduled for release on the Xbox One back in Summer of that year, the game is finally here, and it’s now my task to find out if the wait has been worth it. First impressions are good, with a pleasing retro look and an endearing main protagonist. Charlie looks suitably helpless in his yellow hard hat, and I was just gagging to help him. But the mechanics of the game will take some getting used to. Basically, you control Charlie and the light, and Charlie cannot move unless the light is on him, at least at first. Later on it’s possible to find lamps that store the light, which then empower Charlie briefly, allowing him to move independently. 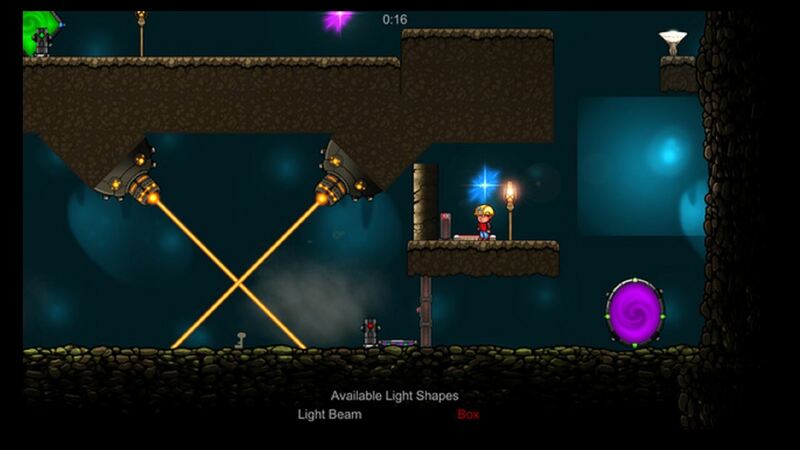 Meanwhile, the light can be used to power switches, open doors or move platforms to aid our hero’s escape. Charlie is controlled with the left stick, and the light with the right. A quick press of the “B” button will lock the light to Charlie, so that it goes where he goes. As you advance through the game, other shapes of light are revealed, changing from a basic box shape to a beam shape, for instance. The beam is tricky to get used to as it is fixed in the middle of the screen, and then rotates around that fixed point, going from one side of the screen to another. This is great if you want Charlie to run across the screen, but makes it tricky to power a switch for a platform, while controlling our man at the same time. The transition between the shapes is triggered when Charlie runs over a switch on the ground, and choosing the correct shape for the correct situation is a big part of how Walk the Light works. As you would expect, the game starts off simple – run Charlie to the exit door across the floor – but soon steps up the difficulty, and by the time you are many levels in, will find the puzzles are tough enough to make your brain hurt. Multiple platforms, door control switches and even keys to pick up to unlock the exit door make themselves known, and planning is required to figure out the best course through the level. 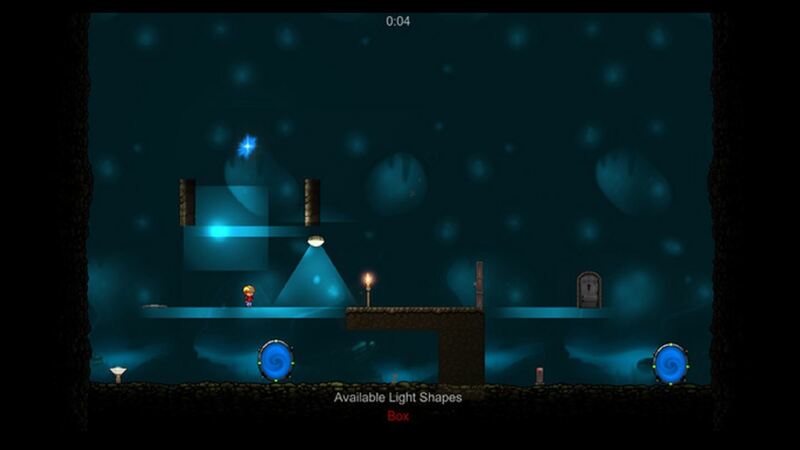 Each stage has a par time attached to it, and beating that par time requires a perfect run through the level. Miss a bounce pad jump? You may as well restart, because the par times are tight. Beating them all is going to be a tall order, and as achievements are tied to beating them, if you want to 100% this game the grind will be a long one. As the levels climb, teleporters, bounce pads, lamps, laser and mysterious machinery all come into play to make your life that little bit more difficult. There are no enemies as such in this game, and Charlie doesn’t get hurt by falling, but if he touches a laser beam, he’s toast nonetheless. So there’s a little bit of peril thrown into the mix. This, then, is the entirety of the game: look at the room Charlie finds himself in, plan the route both for him and the light, then execute your plan. If it works, try it again against the clock, if not, replan, regroup and try again. There is a strong trial and error feel to the game – if I move this platform and send Charlie through that teleporter, where does he end up? – but once you have the method, it is then down to your execution to shave the seconds off. Visually, as I said at the top, the graphics are simple and nicely retro, doing the job intended very well indeed, and delivering a cosy feel to those of us old enough to remember when this graphical style was bleeding edge. The sound is largely forgettable, to be honest, with tunes that just seem to go in one ear and out the other. Each level is a room unto itself and is loaded on completion of the previous level, although they can be quite high vertically, which gives a nice feeling of freedom as Charlie bimbles around in the dark. 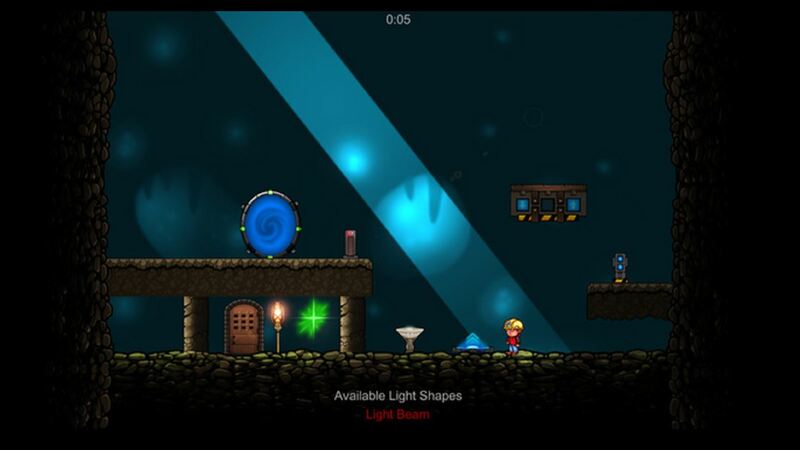 All in all then, if you are in the market for a puzzle game, Walk The Light could well scratch that itch. There are over 60 levels to complete, and the time attack aspect of the gameplay is a strong incentive to better yourself when playing. With a pleasant look and good overall “feel”, this is a game that I can recommend to those of you out there who like to have their grey matter exercised.